Welcome to Growing Up Geek, a new feature where we take a look back at our youth, and tell stories of growing up to be the nerds that we are. We're happy to kick off the series with Veronica Belmont. I was born in the year of the ColecoVision. This isn't that unusual or interesting until you factor in that my mother was a VP at Coleco at that time. OK, well, it's still probably not that interesting unless you're me and trying to figure out the defining moments that turned you into a "geeky" adult. An abundance of video games, toys, puzzles, board games... it's a pretty awesome environment to grow up in, especially for a kid whose father also happened to work in the toy industry (he was an engineer for Hasbro in those days). For me, it was just totally normal to walk into the living room and see a pile of toys on the floor, in varying states of production and disarray. I'd take them apart, put them back together, and spend hours trying to find different ways to destroy them. Things haven't changed too much. While technology and computers were always fascinating to me, my young heart belonged to video games. In the years after the ColecoVision I moved onto the NES, and I amassed an impressive number of cartridges and game play hours before my mom started wondering if perhaps I shouldn't go run around outside for a bit. That soon evolved into PC games (and an unhealthy obsession with everything Maxis and Sim-related), a SNES, Nintendo 64, PlayStation, GameCube, Genesis... well, you get the picture. This isn't that weird for your average geek, but I guess it may be a little less typical for your average adolescent girl at the time. Yet I wasn't even aware that this behavior was somehow different until I hit high school. My mom wasn't trying to convince me to pursue more "girlie" interests; my friends in the neighborhood were totally down to role-play Jurassic Park or TMNT; and I was fortunate (in my opinion) to not have any sibling competition for the consoles or computers until I was 10. There were never any expectations to try and be anything other than who I was, as long as I did my best. By the time I became a totally self-aware and shameless geek, I also realized that to be part of the geek club just means that you're a lot more obsessed than the average person for any particular subject. Calling someone a "geek" doesn't have the same negative connotations it used to: on the Internet, it's a badge of honor, and it means you're passionate. While I still retain many of my perhaps tomboyish interests, my geekiness has grown and changed with me over time: when suddenly I found myself in front of a camera at CNET after doing production work for so long (and not knowing the meaning of "mascara") I threw myself into learning everything I could about makeup. Makeup! Now among my circle of girlfriends (and certain on-camera gentlemen as well) I'm the makeup guru. To me, it's less about what you're geeking out on, and more about connecting with other people that have the same passions as you. Veronica is a technology and gaming-centric video host based out of San Francisco. 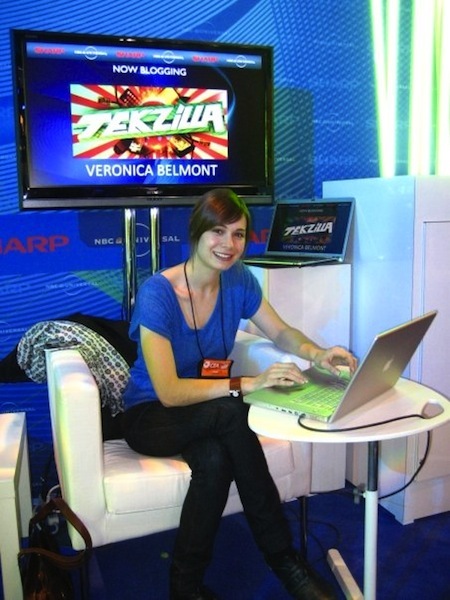 Currently her projects include Qore (a monthly interactive magazine about the PS3 for Sony) and Tekzilla (a weekly tech help and how-to show on Revision3.com). She has also written for Slate, DoubleX, MaximumPC and PC Gamer Magazine. Follow her on Twitter!